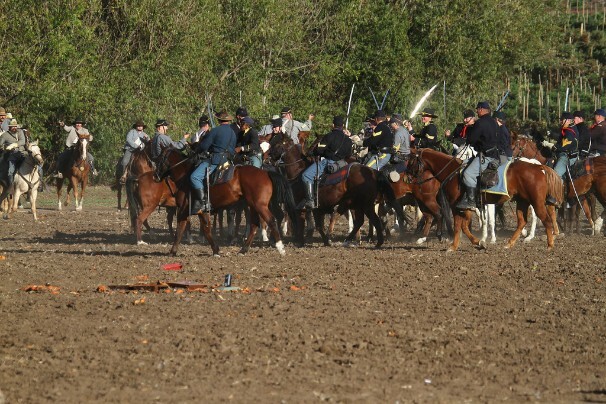 Welcome to the home of the 7th Ohio Volunteer Cavalry Reenactment Unit. We are a group that strive to relive the lives of the soldiers of the American Civil War. We portray the 7th Ohio Volunteer Cavalry and the 8th Texas Cavalry CSA ( also known as Terry's Texas Rangers). "We serve our ancestors by being the best cavalry on the field, regardless of the uniform." Our unit membership is opento men and women. The min age to be on the battlefield is 16 years old. We are an independent unit that supports and offer training events here in Southern California. We are Civil War Living Historians (Reenactors) who portray cavalrymen and the camp life associated with the hobby. We try to keep the history alive. Our goal is to become a highly trained and motivated mounted cavalry unit. Do you need to be trained prior to joining? No, in fact we have had members join us with little training and they have done just fine. It’s important to know that “the horse comes first." Just what does that mean? One thing it means is that in order to become an accomplished Cavalryman, you must understand the horse. You must be willing to care for the horse before you care for yourself. You must be able and willing to care for your horse needs nutritionally, physically and emotionally. You must be willing to become your horse’s friend and bond with your horse. You must understand that your horse will, if he trusts you, give its life for you. You must also understand that if you mistreat your horse he can and will hurt you or even take your life. Joining us as a new mounted member, you must have a horse in good condition and well cared for. There is no excuse for poor horse care and we'll not listen to excuses either. We do not glorify war, nor dwell on the politics of that era. We acknowledge the sacrifices of thousands of brave souls, North and South, and hope to bring a greater understanding of those events to ourselves and to the visiting public who attend our reenactments.